International Open Access week is soon approaching in October – a busy time for UK universities. 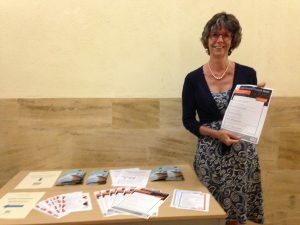 In this guest post, Sally Rumsey, Head of Scholarly Communications & Research Data Management and Juliet Ralph, Open Access Subject Librarian, The Bodleian Libraries, University of Oxford, describe their experiences with trying an ‘alternative’ OA week in the summer of 2018.
International Open Access (OA) week has become a regular feature in the global OA calendar and the wide variety of innovative events popping up always generates plenty of interest. Here at Oxford University our first real participation was back in 2012, prompted by the Finch Report, with daily sessions by internal speakers aimed primarily at raising awareness of this new area among our library staff. We reported on our experience in a guest post on the UK Web Focus blog. Since then we’ve tended to participate on a smaller scale, for example by scheduling our regular OA training sessions during OA Week. This has been for good reason – international OA week falls at a time (late October) when the university is swept up in inductions and other activities that mean attendance at events is to put it mildly, minimal. With external speakers especially we all want to guarantee a decent audience. We can normally rely on librarians to fill some seats, but the perennial challenge is in attracting academics and researchers. So we’ve been wondering what to do about it. Rather than sit on the sidelines, we decided that in 2018 we would try our own local OA week at a different time of year that we hoped would enable more people to participate, especially researchers. The original plan was this it would be held late March 2018. This changed when it was decided it would be preferable to fit in with plans being made by the Social Sciences Division who were working on a series of related events. In 2017 we held an OA day event ‘Publishing, Papers and Peer Review’ targeted at the medical sciences and led by an Oxford researcher, Dr. Philippa Matthews. This event was a success and so we decided to turn it into an annual series, with a similar event during 2018 focusing on the social sciences, and for it to be central to our OA week plans. The date was set for the week of 11 – 15 June 2018, the last week of the summer term. The Social Sciences event was set for Thursday 14th. Key ingredients for the day were an academic lead and joint organization with the academic division. The final programme for OA Oxford Week consisted of 11 events in 7 different venues over 5 days. Now that the dust has settled we can reflect on the successes and challenges of our alternative OA week. It was clearly a good decision to try alternative dates. We feel we benefited from larger audiences than we would have seen in late October. We had a total of about 220 attendees (some people at more than one event): previous October dates had seen only a handful of people, mainly librarians. A couple of sessions in smaller venues were fully booked, and frankly we were unlikely to fill the 100-seat lecture theatre. Our audiences were much more diverse and drawn from all disciplines, with a respectable number from the research community (research students to senior academic staff, and research administrators), in addition to the usual core of librarians. We attempted to focus on the broader research communications landscape, to hear about the visions of policy makers and the opportunities presented by OA for wider dissemination, rather than haranguing authors about compliance. Plus a number of internal speakers, including colleagues from OUP. The social sciences day was particularly successful, superbly led by Oxford academic, Prof. Alis Oancea. Informal feedback indicated that attendees welcomed the mix of topics during that day, and over the course of the week. Overall, we felt that the week opened up conversations around research dissemination amongst those that attended. It was a great chance to meet new colleagues from around the university and hear in person from influential names. On the practical side, we made new internal contacts for venues and catering which should help for the future. On the down side, the week proved to be a huge amount of work in the planning, preparation, publicity and practicalities on the day. For various reasons we ended up with a bigger programme than originally intended, which added to the logistical and publicity challenges, and probably diluted potential attendance. On the other hand it did enable some momentum to develop during the week, and our concerns that the Friday sessions would be empty were totally unfounded. We couldn’t have done it without the sterling efforts of a small group from the library’s OA team. Inevitably, events clashed with other competing commitments for potential attendees, and so researcher numbers were fewer than we’d hoped. We’re asking ourselves whether it was worth it. 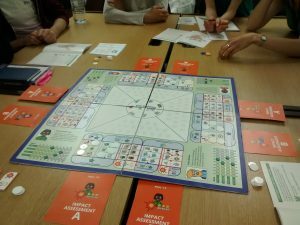 On balance, there is an enthusiastic ‘Yes!’ although we’re now considering what we can learn from this year’s week to boost attendance at future events before we start planning Oxford OA week 2019. Next time we’ll run fewer events during the week to cut down on the workload and consolidate audience numbers. We’ll also try to commandeer more volunteers to help out. Although the cast list of external speakers was fantastic, we may opt for more internal speakers next time. We’ll never avoid clashes with other activities, but we’re considering re-scheduling for earlier in the year during Hilary (Spring) term. We’re taking soundings now to see if a focus on humanities would be desirable – modelling our OA week around a humanities OA day. We won’t attempt to run a major programme during October 2018’s International OA Week, but fingers crossed, we can have as much local impact when we run our 2019 Oxford OA fest. Many thanks to Sally and Juliet for this post. We’d love to hear your OA week plans for 2018 and hear your views on an alternative OA week – please comment below. Posted by Helen Blanchett on September 17, 2018 in Advocacy, Guest post.